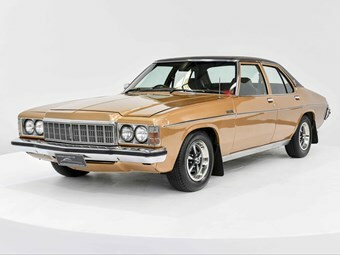 Holden’s HX of 1976 brought with it a host of mechanical alterations in order to meet new ADR regulations regarding exhaust emissions – unfortunately at the cost of power output and fuel efficiency. Exterior changes were minor, most notably found in the grille and badgework, with Premier models receiving a snazzy quad headlight restyle. Engine options when new comprised of the 202ci inline-six, and the 253ci and 308ci V8s; with cog-swapping handled by a three or four-speed manual, three-speed Trimatic or Turbo 400. This vinyl roof Premier presents as an extremely well-kept example of 70s Aussie motoring. Largely unrestored, the listing does note that the car has been repainted, while the original and numbers matching driveline, a 253ci V8 and Trimatic ‘box, are still in place and in great condition. Finished in Contessa Gold Metallic with a black vinyl roof and brown vinyl and cloth interior, the car looks like the quintessential executive family chariot. The car’s history can be traced to its delivery to Nash Holden Lakemba on November 2 1976, and the sale will include the original HX Owner’s guide and Owner’s manual. The car has 212,097kms on it and is available via Gosford Classic Cars in NSW. The car is listed for $35,000, you can check out the full listing here!